My face seems to like a variety of beverages. Currently it’s Pu’er tea but for a period of time, I was using a DIY green tea rinse for my face. Just that after awhile, I couldn’t keep up with the daily usage of green tea powder and I stop drinking the tea too. But it’s a great facial rinse and is still one of my favorite today. 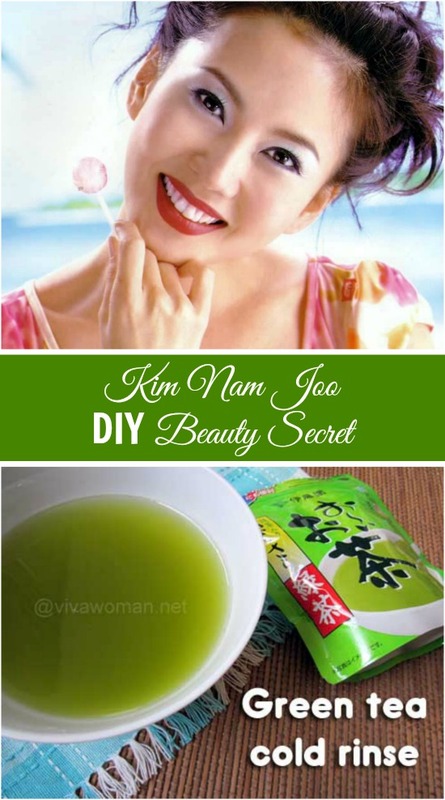 Apparently, it’s also a favorite for Korean actress Kim Nam Joo who is fond of using green tea to wash her face and to keep her pores looking clean and clear. If you don’t already know, Kim Nam Joo is an established South Korean actress who rose to stardom in the 1990s in television series. After 2001, Kim went into semi-retirement, only appearing in commercials, particularly after she got married to actor Kim Seung-woo in 2005 and they started a family. Then in 2009, she made a successful television comeback in Queen of Housewives, a comedy drama that depicts the life of housewives who devote their entire lives to their husbands’ success. (source: wiki). Green tea has rich sources of antioxidant benefits and when applied topically, provides notable benefits for the skin such as anti-aging as well as skin cell rejuvenation. A study performed in 2003 by Dr. Stephen Hsu of the Medical College of Georgia Department of Oral Biology showed that green tea was able to rejuvenate old skin cells that were at the end of their life cycle. Green tea is also widely known to provide some form of sun damage protection by blocking UV rays and this is why it is used in some sunscreen formulations. This rinse is too easy to make. What you need is to make green tea and chill it by keeping it in the fridge. 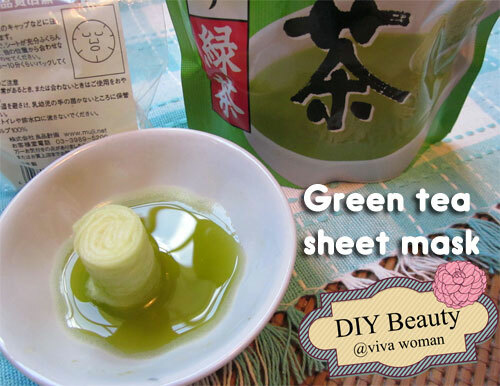 Before using the green tea, wash your face clean with warm water. After that, use the cold green tea to rinse your face again. You can make the green tea with the green tea bags but if youâ€™re using powdered green tea, then the directions is to put 2 cups of water for every 1 teaspoon of green tea powder. 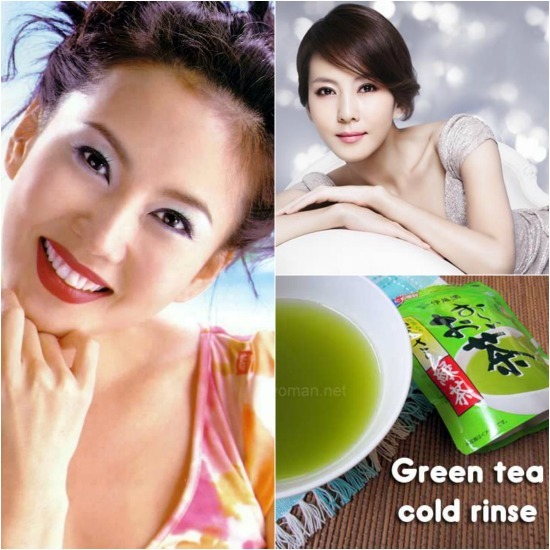 Whether you know Kim Nam Joo or not, I highly recommend you try a green tea face rinse at some point. 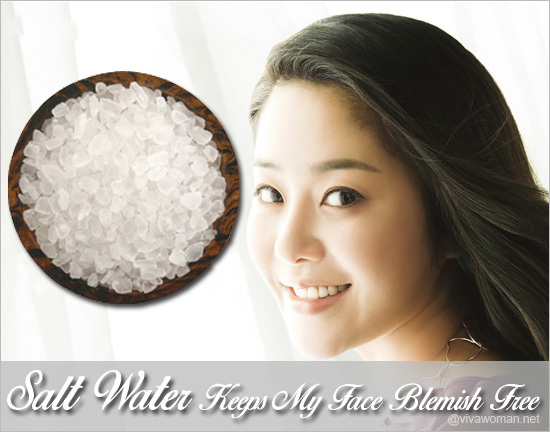 It’s a great DIY for your skin and it’s quite hassle-free. And get the green tea powder if you can afford it because I find that better than using the tea bags. Yes, weather plays a part but I wonder if something like that tried earlier when one is younger might also be more helpful? I think once pores are enlarged, it’s very difficult to make them look smaller. I know grapeseed oil helps some people do that but I don’t know if it’s all that effective too. This is really great tips, defiantly i ll try this. Hi, May I know where do you get green tea powder? How long does it last and how much? You can get it at the Japanese supermarket like Mediya or even some NTUC Finest. It probably can last more 20 usage. Ever since I discovered the various benefits of green tea, which was about three years ago, I’ve been an avid green tea drinker and I doubt anything’s going to ever change that. I’ve seen green tea as a component of many beauty products, especially face care products, but I never figured I could use green tea directly on my skin. It makes sense though, if it can act as a powerful antioxidant from the inside out, it might be useful the other way around as well. I love DIYs that don’t require too much effort and I’ll definitely give this a shot. Thanks for sharing. Yeah, this one is easy and hassle free. No harm trying. 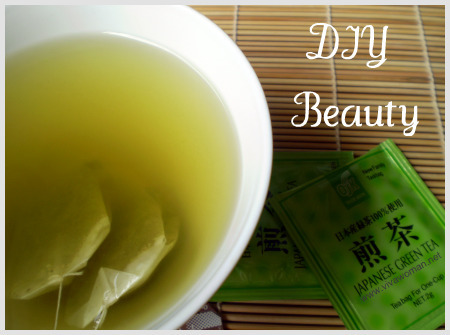 I know many love using green tea as a toner. Very good article! Green tea is really healthy and beneficial to the skin! Hello Sesame!!! It’s been a while since I’ve visited your blog but again, always find interesting and inspiring things to read 😀 I am also using green tea as a DIY facewash and am intrigued about the sun protection effects. I wonder does that mean it’d be more beneficial to use the green tea facewash in the morning rather than night? Or both during the day and in the evening? Plus, I also found that my body is too “cold” (according to TCM) to drink green tea (as it always leads to coughing and thraot irritation even when I drink the tea hot/warm). So now I have switched to genmaicha which worked wonderfully well. In saying so, I have started to use genmaicha tea as my current DIY face wash haha! Hi Carrie, good to “see” you again! I think you can use it both in the day and night, no problem. It has antioxidant effects so will benefit your skin at any time. Most important, it is not photosensitive. I’d just much rather use the green tea as a toner. Just slapping it on your face for a few seconds to wash your face seems to waste it and most of the benefits would go to waste because it wouldn’t have had contact with the skin for very long if you just washed your face with it.Cool idea, though.